Democrats vying for the White House want to talk about anything right now but Robert Mueller’s Russia probe. But the 2020 race is inevitably going to keep coming back to 2016 — and what the special counsel uncovers. Behind the scenes, the candidates, campaign aides and consultants are already plotting how to publicly address the scandal that has consumed President Donald Trump. They know the campaign that gets it right could break free from the cluttered 2020 pack. In the early primary and caucus states, the Democratic hopefuls are already encountering “simmering, seething outrage” about Trump’s possible ties to Russia, said one strategist for a 2020 campaign. The candidate who taps into that anger could ride the wave to the nomination. Speaking up could have disastrous ramifications, though. Much like Democratic candidates in the 2018 midterm elections, the party’s presidential hopefuls are wary of appearing consumed by — and politicizing — a scandal that grips regular Rachel Maddow viewers but seems confusing and distant from the kitchen tables of many Americans. Democrats working for 2020 candidates describe Mueller’s work as something akin to a virus that will keep forcing their campaigns to take precautions. “It’s the elephant in the room,” said the party strategist working with a White House hopeful, fretting about the uncertainties tied to Mueller, from the rumors about possible new indictments to the advice from inside their own campaigns to just stay quiet about the topic. “The Russia issue is one that the political and pollster class says, ‘Stay away from right now.’ But ultimately the story will take us there and we will have to deal with it,” the Democratic strategist added. So far, though, Democrats running to take on Trump have for the most part avoided Mueller. Instead, the candidates have used their precious few media moments to introduce themselves with optimistic narratives — love, inclusion, equal opportunity. When Mueller does come up, the White House hopefuls often fall back on safe terrain, talking up their support for protecting the special counsel from presidential interference or to urge restraint among the party faithful who’ve been clamoring to impeach Trump before Mueller has finished his work. There are notable exceptions to the avoid-Mueller approach. 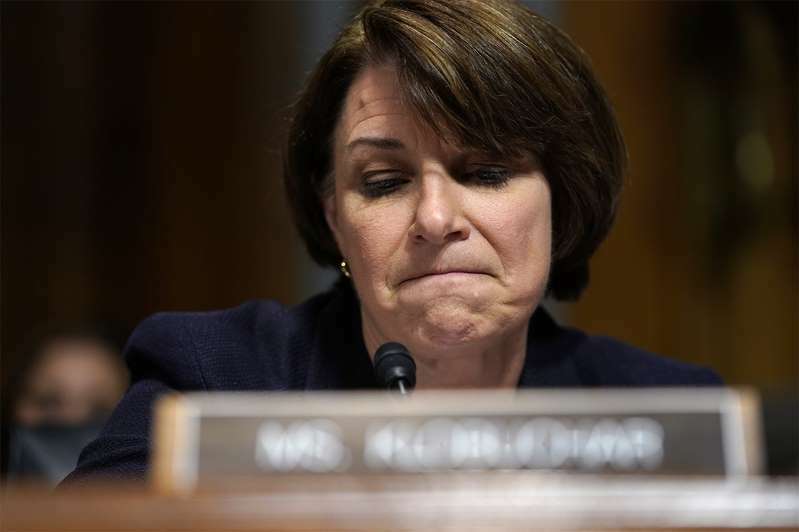 Several senators in the 2020 mix who serve on the Judiciary Committee, including Klobuchar, peppered Trump attorney general nominee William Barr with questions about Mueller last month during his confirmation hearing. Casting a “no” vote against Barr, who refused to commit to releasing the special counsel’s findings in their entirety, is also viewed as an early litmus test for the White House hopefuls in Congress. Perhaps the most blunt 2020 aspirant is Eric Holder. The former Obama attorney general has used Twitter and public remarks to deliver a running commentary on the Mueller investigation. Holder, who is expected to announce his White House plans later this month, has already said he thinks the special counsel has the legal authority to prosecute Trump for obstruction of justice. It’s a bold assertion that runs counter to decades of internal Justice Department policy dating back to Richard Nixon and Watergate. A big challenge facing Democrats who do speak up about Mueller is the uncertainty and secrecy surrounding most everything he’s doing. The special counsel has no deadline, and while acting Attorney General Matthew Whitaker recently said that the special counsel’s probe was “close to being completed,” the constant churn of new revelations suggests the investigations will reverberate until the general election. Former Trump aides Paul Manafort, Rick Gates and Michael Flynn still haven’t received their sentences despite pleading guilty, while longtime Trump associate Roger Stone is on track for his own criminal trial in the late summer or early fall in Washington, D.C., a spectacle guaranteed to generate nonstop media coverage and return attention to Mueller’s efforts. The investigation’s inscrutability also means that jumping to comment on the latest Mueller revelation can boomerang quickly. A day later, Mueller’s office issued a rare public statement questioning the article’s accuracy. The rebuke gave Trump and his allies an easy opening to attack Democrats who had pounced on the news. Politically, having smart responses ready on the Mueller front makes sense for Democrats who are already venturing to early primary battlegrounds like Iowa, New Hampshire and South Carolina. The 2020 strategist said that’s where candidates are encountering grass-roots anger about the Trump campaign’s encounters with Moscow. If big news breaks, they don’t want to be left out. But he said the campaigns need to be preparing for all contingencies, including perhaps the most detonative scenario of all: a smoking gun that forces Trump and even Vice President Mike Pence off the 2020 ticket. “Behind the scenes, they’ll have a very good contingency plan in place for the Mueller investigation in case the findings are truly explosive, in case it calls into question whether he will remain president,” LaBolt said. Scott Mulhauser, a former senior aide to Vice President Joe Biden who keeps in touch with several 2020 campaigns, said the Mueller probe will continually force the Democratic field to perform “an inherently odd dance” between sounding presidential about the special counsel’s need for space and speaking to a party base that wants Trump out of office by any means necessary. Historically, presidential campaigns of both parties haven’t shied away from using scandals as a way to boost support with voters, though the results have been mixed. Republican Mitt Romney tried to hang a failed investment in solar energy company Solyndra around President Barack Obama in 2012, even traveling to the Bay Area company’s empty headquarters in the midst of the general election campaign to harp on the administration’s loss of a half-billion dollars in taxpayer money. In each case, the strategy failed to significantly move the needle. “Scandals matter” in the course of any presidential campaign because they “allow opponents to seed the clouds of doubt,” said Frank Sesno, a former CNN journalist who asked Bush about the indictment during a live town hall interview broadcast just days before the 1992 election. He also predicted the Mueller probe will stand out far more in 2020 than the other presidential scandals that have come in the post-Watergate era.